Not so long ago, Father Judge was just trying to win some football games on a consistent basis. Now, the Crusaders can’t stand to allow a single point. Heading into their contest against Bonner-Prendergast Saturday afternoon at Upper Darby High School, the Crusaders had not allowed a touchdown in three and a half games. Three quarters later, the shutout streak had risen to 17. Holding a 21-0 lead on the strength of efficient passing by junior quarterback Zach Carroll and three touchdown runs by sophomore Yeedee Thaenrat, Judge had the ball deep inside Bonner-Prendergast territory as the final minutes ticked away. Suddenly out of nowhere, an errant exchange on the snap resulted in a fumble and mad scramble. 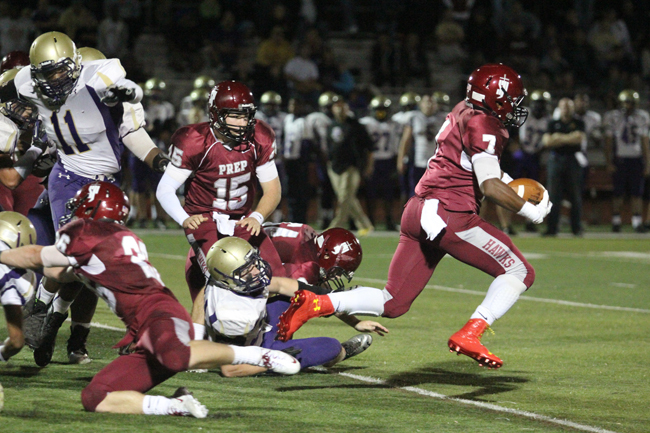 In came B-P senior John Durkin, who picked up the bouncing pigskin at the 22 and rumbled 78 yards for a touchdown. “The Streak” was officially over. Durkin said he could feel a pursuer breathing down his back. So he cut back inside the 20 and rumbled the rest of the way home, causing a deafening silence from the Crusaders’ sideline. It was to Father Judge. That all changed when Bonner junior quarterback Collin DiGalbo lofted a gorgeous 48-yard touchdown pass to senior Kyle Dawson down the sideline with four seconds left. As the Crusaders exited the field, they appeared in a rather subdued mood. Galasso, a member of St. Anne Parish in Philadelphia who has two younger sisters and six younger brothers, understood his coach’s point. Lansdale Catholic improved to 5-0 with a 36-13 win over Neumann-Goretti. Ryan Quigley (15 carries, 113 yards, two touchdowns) and Michael Isabella (9-62, two scores) did most of the damage for the Crusaders, who have now outscored their opposition by 171-26. Next week Lansdale Catholic begins play in the Catholic League Class AAA Division. Their first opponent will be Bonner-Prendergast. That will be followed by a home contest against defending champion Archbishop Wood. Against Cardinal O’Hara, Wood improved to 5-0 with a 41-0 Class AAA victory. An efficient running game saw four players eclipse the 40-yard mark. Quarterback Tom Garlick connected on 9 of 13 throws for 178 yards, with two of those completions going to Christian Lohin for 99 yards. Teammate Jarrett McClenton scored two rushing touchdowns and also returned an interception for a score. In a Class AA Division tilt, Archbishop Carroll defeated Conwell-Egan, 48-26, as Austin Tilghman (16 for 150) and Anthony Hill (5 for 88) each scored twice. Sean McMorran fired a pair of touchdowns to Shawn Springs, who also scored on an interception return. For C-E, Andrew Linder gained 105 yards on 17 carries while Joe Ruggiero amassed 93 on 13 and scored twice. West Catholic opened its AA play with a 52-14 win over Bishop McDevitt. Antoine McCollum completed all three of his three passes for 173 yards and two touchdowns. Greg White gained 132 yards and scored three TDs on only seven carries. Calil Wortham added 78 yards on nine totes. In the Class AAAA Division, La Salle benefited from Kyle Shurmur (15 of 25 for 167 yards and two touchdowns), Jimmy Herron (6 catches for 85 yards and two scores) and Nick Rinella (17 carries for 82 yards and a touchdown) to stop Archbishop Ryan, 28-14. For the Raiders, Connor Golden enjoyed a career day with five catches for 141 yards and both Ryan touchdowns. Also in the AAAA, St. Joseph’s Prep defeated Roman Catholic, 42-7, behind Chris Martin’s 8 of 12 passing for 181 yards and two touchdowns. Five different Hawks scored, with freshman De’Andre Swift (145 total yards on six overall touches) reaching the end zone twice. Roman’s lone score came courtesy of junior John Chaney’s 87-yard kickoff return. Chaney is the grandson and namesake of the retired legendary Temple University basketball coach.